To promote an open-street community model among new residential complexes, and follow the principal of no longer building closed-off residential communities. Already built residential communities and work unit walled compounds will gradually be opened, opening them to thoroughfare roads and publicization and resolving their transportation road layout problem. The government and state-media quickly jumped into action to placate the anger. 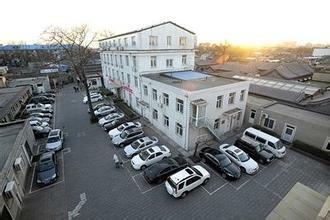 The Ministry of Housing announced that “the gradual opening of closed communities and work unit walled compounds won’t be applied “uniformly and without exception” and won’t be be done “in a headlong rush”, and that residents’ legal rights and interests will be heeded. A not-so-subtle interview with an expert in the Global Times 环球报 attempted to assure residents that giving up their walls won’t lead to an increase in crime. And the Supreme People’s Court assured the public that it would “pay close attention” to the enforcement of the law. Urban Brawl: China Targets ‘Weird’ Buildings, Gated Communities – Wall Street Journal The guidelines for development of China’s cities, released over the weekend, are the outcome of a high-level government confab held in December to address the challenges of managing the rapid, at times haphazard urbanization that is one of the most visible expressions of the country’s economic transformation over the past 35 years. [Related] China Moves to Halt ‘Weird’ Architecture – New York Times Experts say that as a result of the new guidelines from top leaders, they expect stricter design standards for public buildings. Wang Kai, vice president of the China Academy of Urban Planning and Design, under the Ministry of Construction, said that functionality should take precedence in public buildings. “We shouldn’t go overboard in pursuit of appearances,” he said. [Related] 打开我家大门，七成网友不乐意 新浪新闻 《意见》中，最引人注目的新提法是“新建住宅要推广街区制”，“已建成的住宅小区要逐步打开”。这引发了网友热议，购房时，小区内的道路都算公摊交了钱，算是业主所有。如果开放了，是不是违背了现行的《物权法》？在新浪网的《住宅小区不再封闭，大院要打开，你支持吗？》调查中，七成多的网友明确表示“不支持”，“人身财产等安全问题”成了网友最担心的问题。还有八成网友认为，封闭小区逐步打开以后，“业主应该获赔”。Archived below. 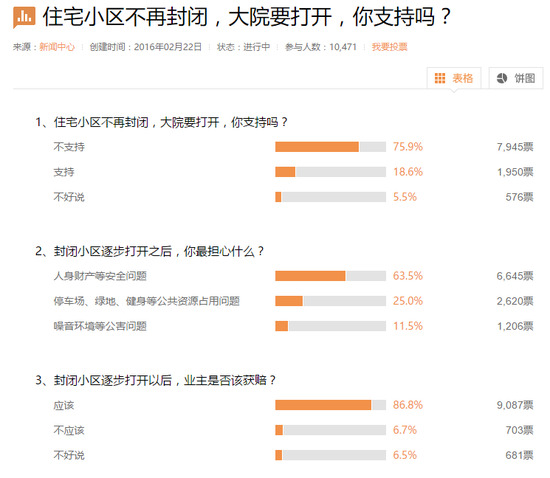 Online poll strong strong opposition among online users to tearing down community walls, fear of resultant crime, and demand for compensation if their walls are removed. [Related] 最高法：“小区开放”还需立法_头版_新京报电子报 程新文称，封闭住宅小区是农耕时代的产物，我国现在已经处于21世纪工业化、信息化和新型城镇化的新时代，推进现代化城市建设需要我们有新的理念和探索。上述举措的目的是为了实现物和有关资源效益的最大化，是一个非常具有前瞻性的、与时俱进的城市发展理念，符合当今世界的潮流和发展趋势，对于推进城市现代化具有重要指导意义。The Supreme People’s Court issues document stating that wall demolition must occur in accordance with the law. [Related] 发改委官员谈“小区开放”：存量封闭小区不是改革重点 – 经济 – 中国经营网_中国经营报 是的，目前封闭小区过多过滥、面积过大是造成城市交通拥堵的重要原因之一。城市的交通系统可分为主干道和微循环系统，由于大量的社区和房地产开发区处于封闭和大院状态，社区道路和社会道路无法连接，造成城市微循环系统的梗阻现象。有些封闭社区面积多达数平方公里，北京市的天通苑社区就是一个典型的例子。微循环不畅，就会造成主干道拥堵。大院内部的路网系统和社会不连接，也会影响到的居民出行。而社区外的居民经过封闭社区时只能绕道走，也为城市居民的出行和交通带来了诸多的不方便。Interview with NDRC 发改委 head, which aims to mollify homeowners fears that their communities will be targeted — gated communities that will be targeted, at least initially, are especially large and disruptive to traffic flow. 拆除封闭小区围墙，从机关大院做起_观点频道_财新网 拆除封闭小区的围墙对于缓解拥堵确实是一个好办法。建议中央机关大院要做出表率，要执行这个文件，就从自身做起，从拆除自家的围墙开始。In respect to solving city congestion, demolishing the walls of closed communities is indeed a good method. We suggest the the central organ should use their own courtyards are a model of enforcing this edict. Start with yourselves and tear down the walls of your own homes first. Archived below. 作为一个整体，他们没有受到知识分子所经受的各次政治运动的冲击，也没有工农所经受的贫穷生活的压力。在文革到来之前，干部阶层始终是社会的佼佼者。因此，这一代干部子弟是在一种有利于他们身心健康的环境中长大的。他们在心理上没有受到过压抑，因此他们不仅相对健康，也相对强势。他们鄙视人情的俗气，看不起文人的酸腐，也冲破了市民的奴气，中国社会诞生了一批天不怕地不怕的红色青少年。应当说，只有心理上的强势，才会培育出敢做敢为的担当，同时如果没有约束，也会衍生出目无法纪尊长的狂傲。相对其他社会阶层，干部子弟承受压力和打击的能力也明显更强一些。Piece on the culture of gated communities 大院文化 draws link between an upbringing in communities insulated from the outside world and the rise of “red guard thinking” 红卫兵思想 during the Cultural revolution. Archived below. Begin typing, available tags will appear.